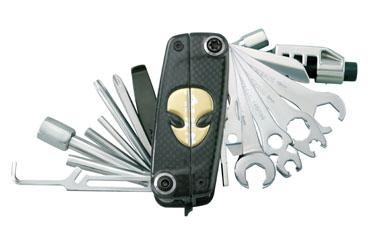 The latest addition to the successful ALiEN™ series is the ALiEN™ III, featuring twenty-five high quality tools to cover a broad range of road or trailside repairs. Stronger and smaller than the popular ALiEN™ II, ALiEN™ III features a new pressed stainless steel shell for added durability. A new ALiEN™ logo creates an alien face when reassembling the two halves making alignment easy.